I’ve bitten into chocolate rabbits. I’ve snacked on chocolate eggs. And if you live in New York, next week, you can see a naked, chocolate Jesus (or you can just visit the website here). I’m curious about how you go about making a confectionary sculpture of the savior. Do you make a big mold and pour the chocolate in? Do you start with a big block and start chipping away with a chisel or your front teeth? And how do you prevent it from melting? 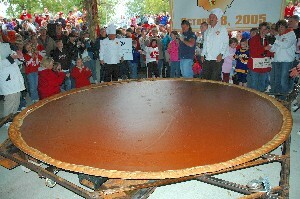 And to prove that it’s not only Americans doing strange things with their food, South Africa broke the record for the world’s largest pumpkin pie this week, though I can’t find any pictures of their accomplishment. The record was previously held by the New Bremen Giant Pumpkin Growers in New Bremen, Ohio. They baked a 2,020 pound pie on October 8, 2005 and if I’d known they were doing that I would have hopped in my car and driven next door to Ohio to help them eat it. Pumpkin pie is my favorite pie by far. It tickles something in my brain that no feather can reach, sending jolts of tasty pleasure throughout my whole body. Mmmm. I find it fascinating that the New Bremen pie lost 200 pounds during the baking process. Wow! To think, I could have bypassed these past two and a half years of fat fighting if I’d just stuck myself in an oven for a couple hours. It’s a little sad looking at the New Bremen team’s certificate from the Guiness World Records. Do they get to keep that or do they have to shred it now that it’s been broken? Or do they just get their giant pie oven out of storage and try to break that record again? Earlier: Think I can sue for damages? Hilarious! Thanks for the links, too! Huh. You could be on to something there. Maybe in the future, “they” (whoever “they” are) will create special tanning bads that don’t just tan us, they actually cook the fat right out of us. Now I’m starting to think about things like drippings and I’m getting grossed out. I totally want to jump on that pie like a trampoline! PQ – That’s right! I saw you mention that on the blog. If you visit chocolate Jesus you must take a pic for us! I will not be making a pilgrimage to NYC to see stale chocolate Jesus. I’m sorry, I stopped reading and started thinking of the BIG SCOOP of vanilla ice cream that would need to go with this. yummmmmm, Can’t help, but wonder how many calories that giant pie contains. PQ – Heh! Yeah, how many points are in a two thousand pound pie? Somebody call Weight Watchers! Okay, I am a total math dufus. They included a list of what they put into the pie on that web page. I used SparkPeople and an Excel spreadsheet to calculate that the pie before baking had 1,093,099 calories. However, it lost 200 pounds while baking, so it probably came in at under a million calories :) They said it made over 3000 pieces, so that’s at most 333 calories a piece, which sounds reasonable and means I probably didn’t screw up my decimal points. Do you think if I sat in a sauna for a few hours I would drop 200 lbs? LOL. I’m from South Africa and haven’t even heard of the pumpkin pie! Just as well, I suppose! I think they kept the information from me on purpose! James: Each year my mom makes a candy Nativity scene. Carter: James, at work, just call me Carter. I am always freaked out by Giant Food. Like eating contests, it just seems so wasteful and pointless. Maybe they just haven’t yet made anything I’m very interested in… pumpkin pie is not high on my list. Whataburger now offers, in addition to its hot apple pie, lemon pie (good), and pumpkin pie (awful). I didn’t know it was actually possible to mess pumpkin pie up but somehow they managed. I love pumpkin pie too – it may be the only kind of pie I actually will eat. The crust issue is another thing. You can call this pumpkin mousse and bypass the crust. As far as the pumpkin pie; I could totally dig into that without any guilt what so ever!! Love your website! Congrats and way to go on your numbers! Hi I have your site on my blog as I have just started blogging. If you add people to yours I would be greatly appreciate it http://www.lizzytish-thewomanwithin.blogspot.com. What kind of person would make a chocolate Jesus? Oh yeah, the kind that doesn’t believe that He died for their sins. Its a shame. I hope that the “artist” sees it before its too late. Jesus can save your soul. I know it is easier to live a life that is carefree and such but it is so much better knowing where I will be at the end of my life. We also don’t have pumpkin pie really in Australia. I just think it sounds weird! Oh, this is divine providence for sure! I’ll be in NYC that very weekend, and I’m determined to make it to the chocolate Jesus gallery now. I’m like 132% more excited about my trip now…thank you! “Wow! To think, I could have bypassed these past two and a half years of fat fighting if I’d just stuck myself in an oven for a couple hours.” See, PQ, this is why I love you. That made me laugh out loud.